Home Plays Does My Bomb Look Big in This? Tamasha and Nyla Levy present the thought-provoking new play, Does My Bomb Look Big in This? Does My Bomb Look Big In This? Soho Theatre tickets now available! Nyla Levy's brand new play, Does My Bomb Look Big In This?, is set to play at the West End's Soho Theatre for a limited engagement this summer as part of its 2019 tour with stops in London, Reading, and Luton. What is the Does My Bomb Look Big In This? play about? Yasmin Sheikh feels lost in a city she once called home while her best friend, Aisha, sees a different side to London then Yasmin. When Yasmin suddenly buggers off to Syria, Aisha sets off on a mission to discover the truth and determine whether Yasmin's new world has any hope at all, or if it's all just a hopeless place. Does My Bomb Look Big In This? is a fierce new play packed with disarming honesty that brilliantly explores the human condition concealed underneath news headlines and dares to ask the question we're all thinking: "Are we anywhere near closer to multi-cultural harmony, or is it all just a fairytale pipe dream?" Conception and writing process for Does My Bomb Look Big In This? 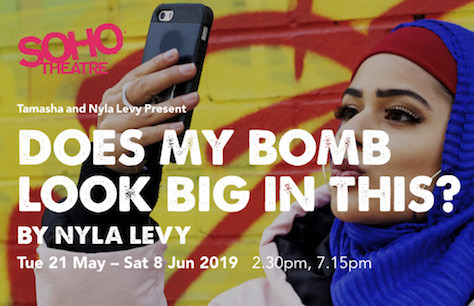 The new self-penned play by Nyla Levy, Does My Bomb Look Big In This?, was first conceived in 2016 after Levy was cast in such dishearteningly titled roles as 'terrorist girlfriend' and 'jihadi bride.' Unhappy with the narratives being told, she ran a series of workshops with children and spoke to various members of the Muslim community leaders and terrorism defence solicitor, Tasnime Akunjee. The end result became a collection of narratives detailing the vulnerabilities and choices made by wasted youth and how their decisions affected their countries, communities, and lives for good. Scratch performances of Does My Bomb Look Big In This? received much positive feedback, with praise being given its rawness, fresh voice, and accurate representations of a marginalised community. Cast and Creatives of Does My Bomb Look Big In This? Does My Bomb Look Big In This? was written by Nyla Levy, who also stars in this unique one-woman show. It is directed by Mingyu Lin and features a creative team consisting of design consultant Moi Tran and sound designer Conrad Kira. Don't miss this one-of-a-kind play by Nyla Levy as it makes a special stop at the Soho Theatre Upstairs this summer as part of its 2019 tour. Book your tickets to Does My Bomb Look Big In This? today. Next Available Performances of Does My Bomb Look Big in This?